Department of Botany, D.S.B. Campus, Kumaun University, Nainital, India. 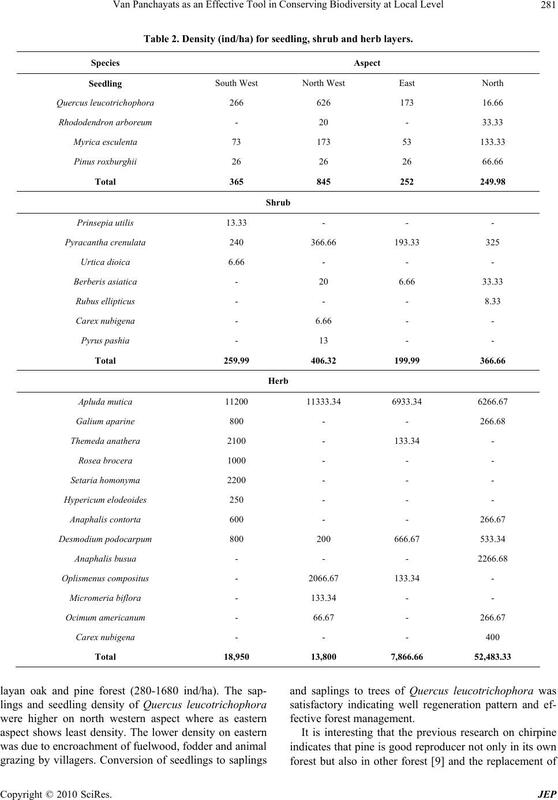 Received April 3rd, 2010; revised May 13th, 2010; accepted May 15th, 2010.
tween 193 to 324.3 in d /ha, sapling density between 119 to 258.6 ind/ha and seedling density from 249.98 to 845 ind/ha. arities subtending a wide range of vegetation types . ultimate disappearance of the oak forest from the region. aged forest is not stabilized, but is instead increasing . conserving and regenerating forest under their control. mean minimum temperature from 5.8℃ to 19.5℃ . layan moist temperate oak forest, subtropical pine forest. hours and the frequency of collection by each family. and number of samples was determined following . ind/ha each) at north west and eastern aspect respectively. north west and eastern aspect. and eastern aspect (Table 3). Table 1. Vegetational parameters for tree and sapling layers. north and east aspect respectively. 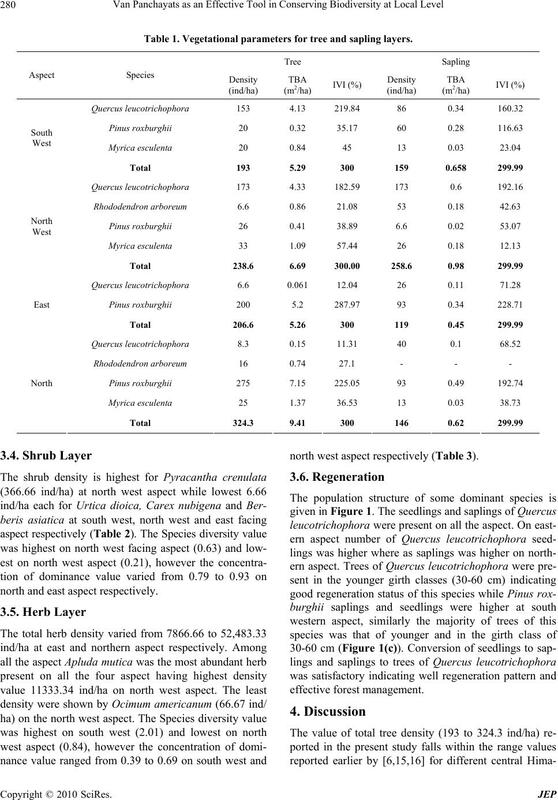 north west aspect respectively (Table 3). Table 2. Density (ind/ha) for seedling, shrub and herb layers. Table 3. 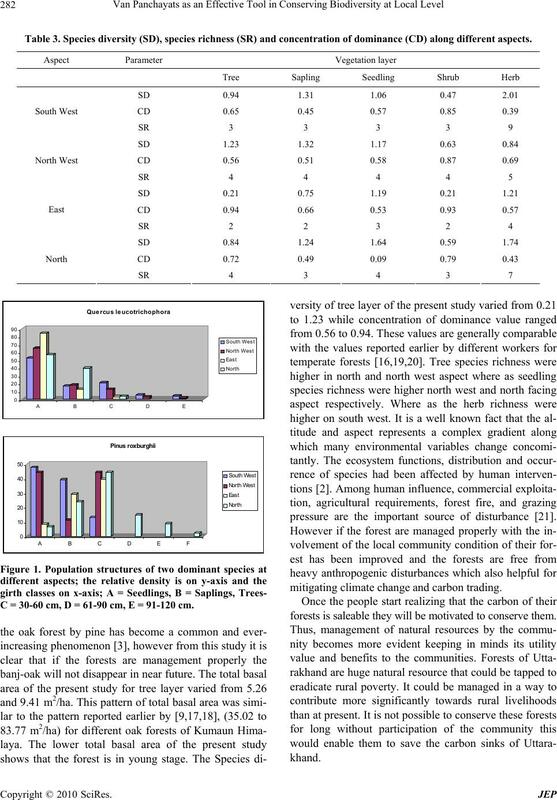 Species diversity (SD), species richness (SR) and concentration of dominance (CD) along different aspects. C = 30-60 cm, D = 61-90 cm, E = 91-120 cm. pressure are the important source of disturbance . mitigating climate change and carbon trading. forests is saleab le they will be motivated to conserve them. Himalaya,” Botanical Review, Vol. 53, No. 1, 1987, pp. Vol. 19, 1984, pp. 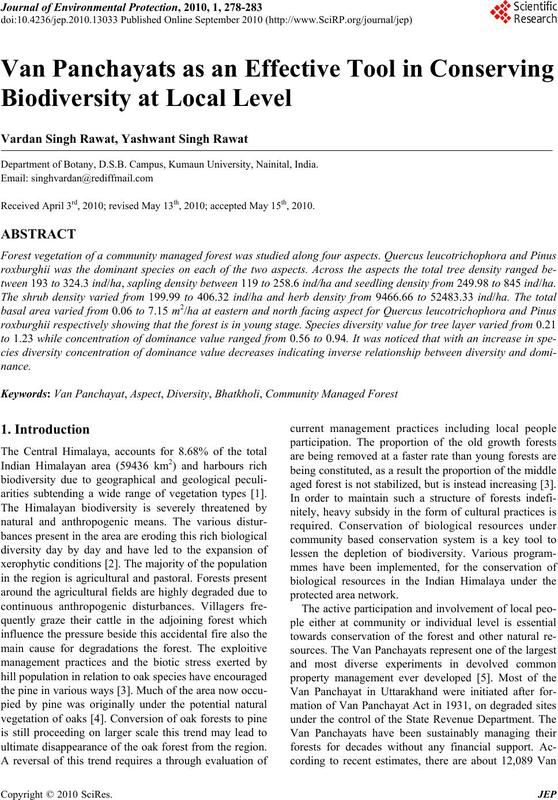 307-324.
the Forest Types of India,” Government of India, Pub. Division, New Delhi, 1968, p. 404.
tute, Oxford, 1991, p. 14.
sis, Kumaun University, Nainital, 2006. Vol. 15, 2008, pp. 75-81.
acters,” Ecology, Vol. 31, No. 3, 1950, pp. 438-455. Diversity,” Taxon, Vol. 21, No. 2-3, 1972, pp. 213-251. 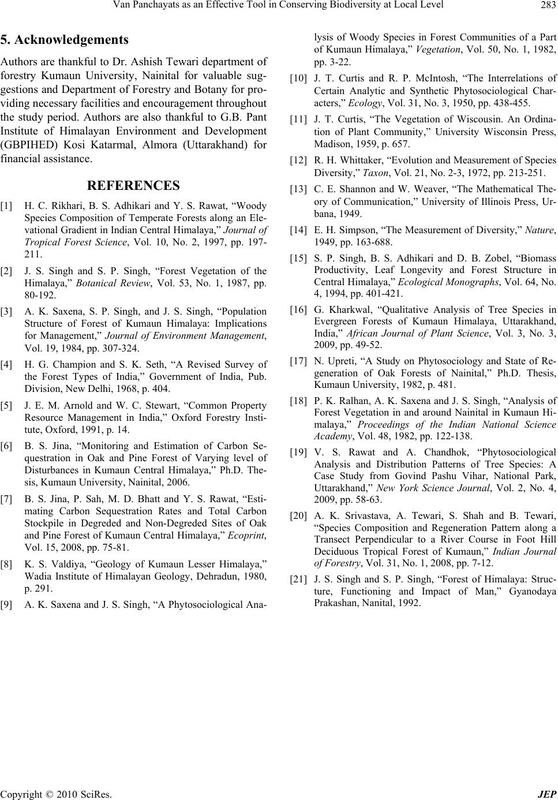 Central Himalaya,” Ecological Monographs, Vol. 64, No. Kumaun University, 1982, p. 481. Academy, Vol. 48, 1982, pp. 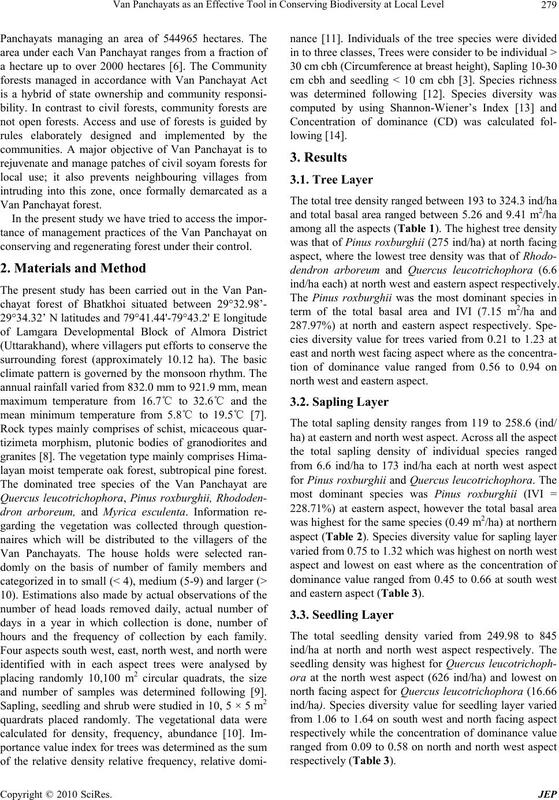 122-138.
of Forestry, Vol. 31, No. 1, 2008, pp. 7-12.